The objectives of this study were to ascertain the feasibility of transcanal endoscopic underlay myringoplasty using temporalis fascia and compare the results with microscopic myringoplasty. This prospective randomized trial included 60 patients with mucosal chronic otitis media with tympanic membrane perforations of all sizes and locations apart from posteriorly based small or moderate sized perforations. In the endoscopy group, 30 patients underwent exclusive transcanal myringoplasty using tympanomeatal flap elevation with underlay graft placement. 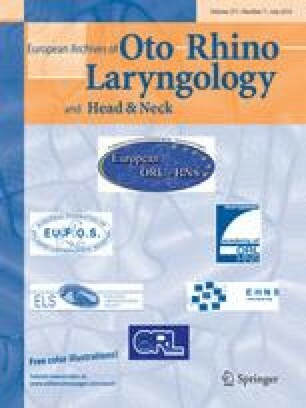 In the microscopy group, 30 patients underwent myringoplasty using the postaural approach. Intra-operative variables compared were canalplasty and canal wall curettage for assessment of ossicular status. Graft uptake, hearing outcomes using pure tone audiometry and subjective cosmetic outcomes were assessed 24 weeks post-operatively and compared in the two groups. Resident feedback on the feasibility of endoscopic myringoplasty was obtained using a questionnaire. In the microscopy group, 5/30 patients required canalplasty due to canal overhangs and 4/30 required canal wall curettage for ossicular assessment, whereas none of the patients in the endoscopy group required these procedures. A graft uptake rate of 83.3 % was observed in both groups post-operatively after 24 weeks. Mean air-bone gap pre- and post-operatively in the endoscopy group was 28.5 and 18.13 dB, respectively, whereas these values were 32.4 and 16.9 dB, respectively, in the microscopy group. Subjective cosmetic outcomes were better in the endoscopy group. Resident feedback on endoscopic myringoplasty was positive. Endoscopic myringoplasty appears to be an effective alternative to microscopic myringoplasty and results in excellent hearing with good cosmetic outcomes.